My pollination technique seems to have worked so far with the apricot but there is still a long way to go before we manage to harvest any ripe fruits. 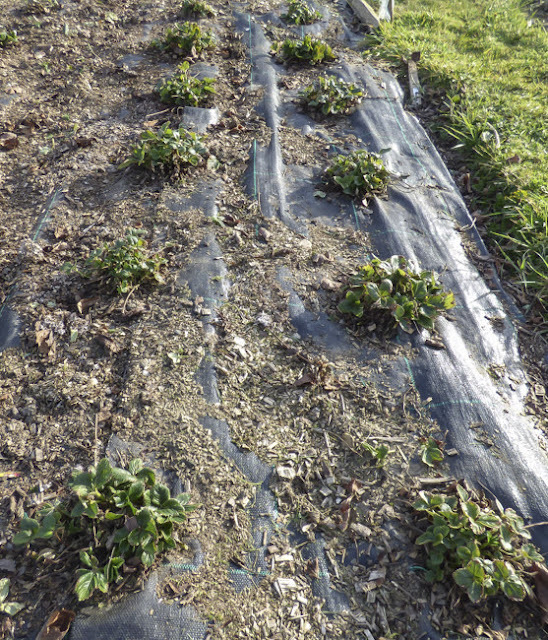 The strawberries are all tidied now and so I had a chance to assess how each variety had fared over winter. 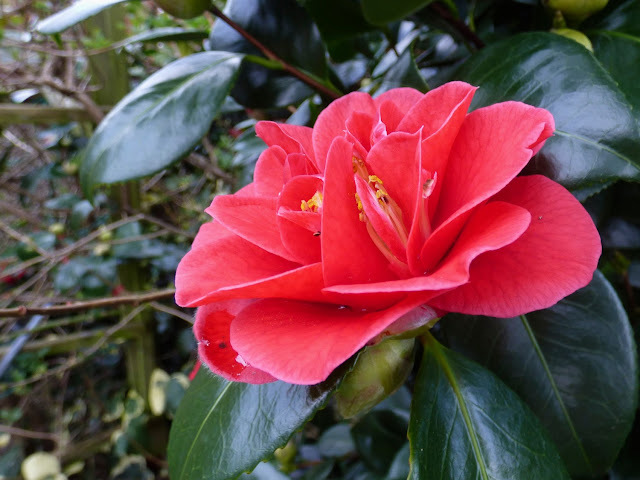 You may remember that we planted new plants last year so they have just come through their first winter. Although this was mild it was also very wet. We planted though weed control fabric mulched with bark chippings. As expected last year the plants produced very little fruit but they kept me busy removing the prolific number of runners. We ordered eight varieties - ten plants of each. 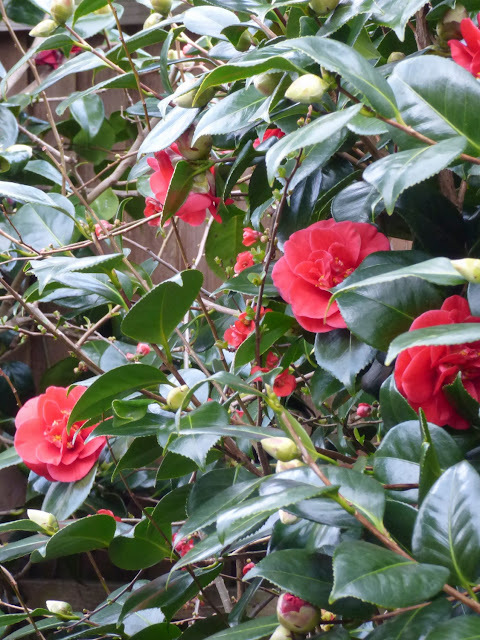 These were initially grown on in pots and planted out on 10 April - almost a year ago. Cambridge Favourite has been around for some time but is still a favourite variety. 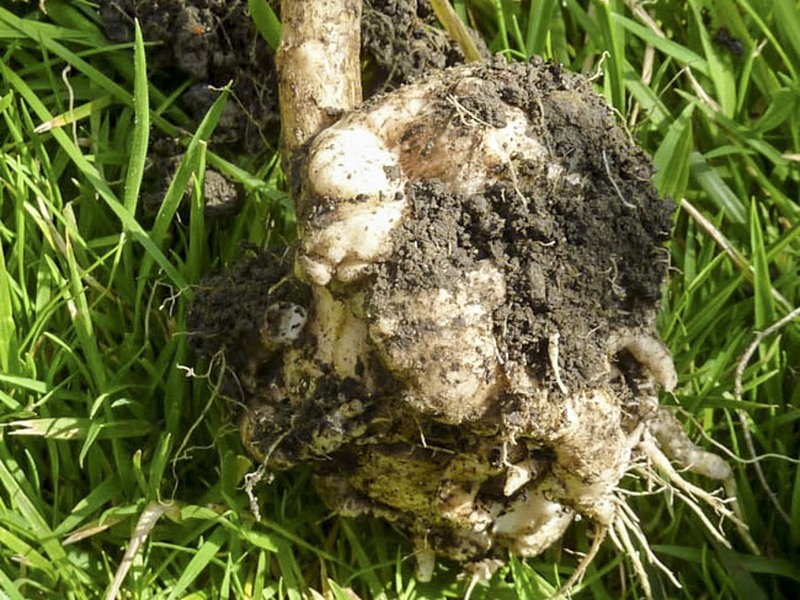 It is reputed to crop heavily and have good disease resistance. Fruit is produced from mid June. All the plants we planted have survived and look strong. Elsanta has so far been a disappointment . It was one that we had high expectations of. A couple of the plants died off in the pots before planting. It is supposed to fruit at the same time as Cambridge Favourite but the plants are at nothing like the same stage. A couple seem to have disappeared completely. Royal Sovereign dates back to 1892 and is said to survive through the years for good reason. Another variety that should fruit from mid June. Like Cambridge favourite the plants look well. We have grown Marshmello before and found it to be a good cropper. 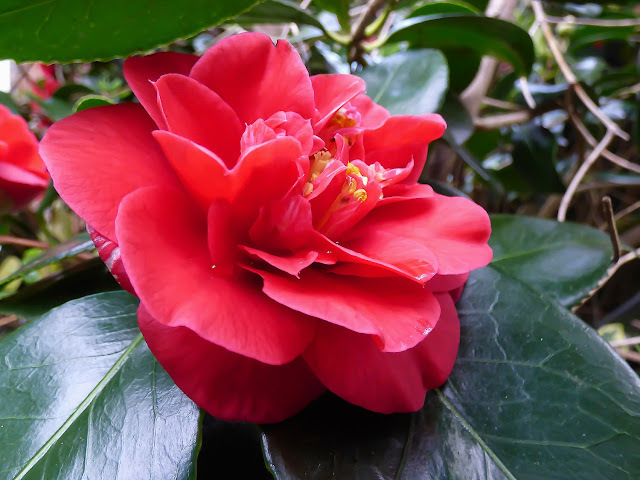 It should produce fruit from late May. Although the plants are small they look to be producing some good new growth. One plant seems to have disappeared. Vibrant isn't living up to its name at all with quite a few plants having disappeared and the rest producing little growth. It's supposed to be an early cropper and so it has some catching up to do. Fenella is reputed to be a tough plant that stands up well to humid and rainy conditions. It crops from mid July. All our plants look strong and healthy. Cupid is another late cropper reputed to be a vigorous grower with very good disease resistance. Our plants are growing well. Malwina is another late variety said to have a high level of disease resistance although since buying I have read that this variety can be susceptible to a problem whereby leaves grow from the fruits - I hope that we don't experience this problem. At this point the plants are doing well. Hopefully the next stage will be to taste test sun-ripened fruit. A girl can dream can't she? Normally by this time most of our ferns have died back and are crying out to be tidied but this year the greenery appears to have decided to hang on until the last minute. 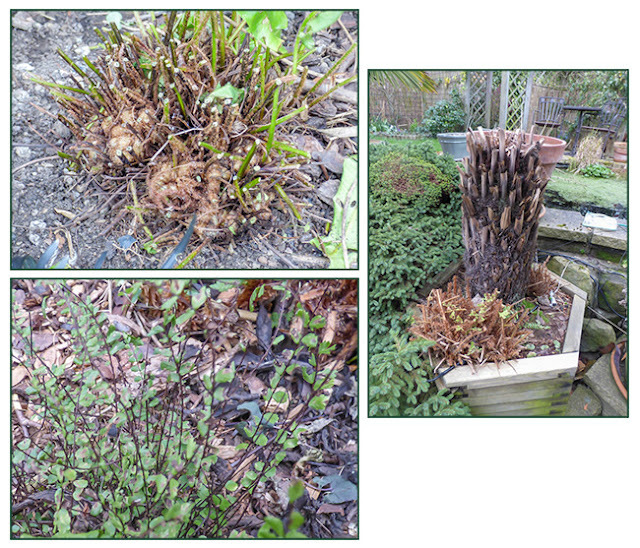 At the beginning of this week the fernery bed looked like this. There was still lots of greenery but last year's growth was dying back and in some smaller more delicate specimens had died back completely. I thought that I had better cut off the old fronds before the new growth started to appear and mingle with the dying fronds. It's much easier to cut back ferns without the fear of removing new growth along with the old. As well as in the fernery we have ferns dotted around the garden and so I ended up with a couple of compost bags full of debris. I couldn't have left things much longer as some of the plants already were sporting new growth. 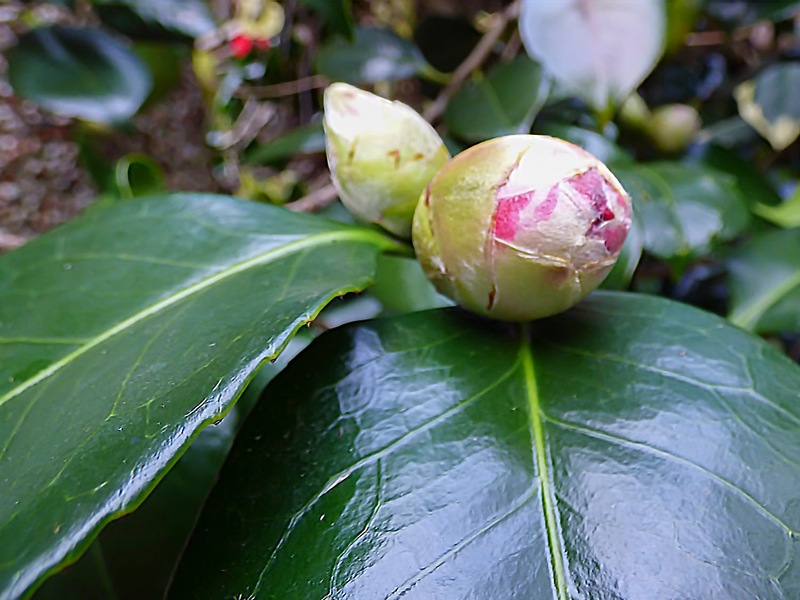 It won't be long before the new growth or croziers begin to spring up. At the moment there are just some vague signs of activity in the centre of some plants. Not quite at the stage where they remind me of sleeping tarantulas. The fernery now looks like this. I also trimmed the passion flower - in fact I was very tempted to cut it back more harshly - any advice on whether I should do this? 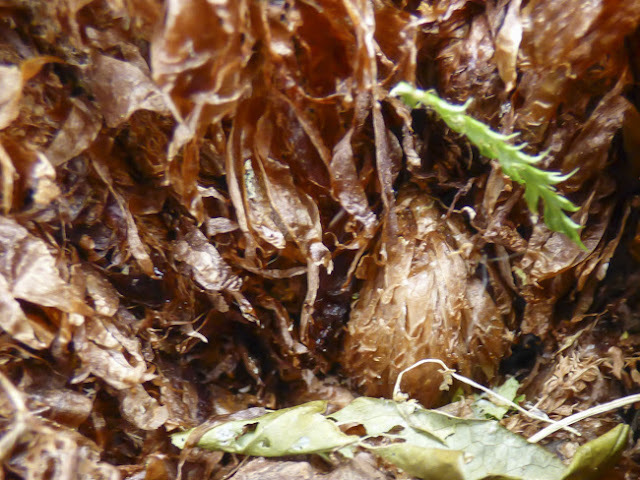 As it was the passion flower shoots were emerging in between the ferns and had to be pulled out. 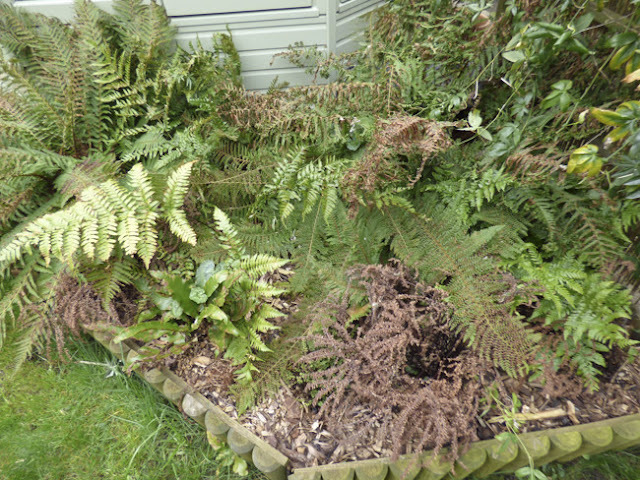 One problem when cutting back the ferns is that it exposes the black box containing all the electrics for the pond. Happily this will soon be hidden again. Last year I was convinced that some adventurous slug has slithered its way up the trunk of the peach tree to nibble at the fruits so this year I decided to take what I hope will be preventative action. This involved donning a plastic glove as things were going to get messy. 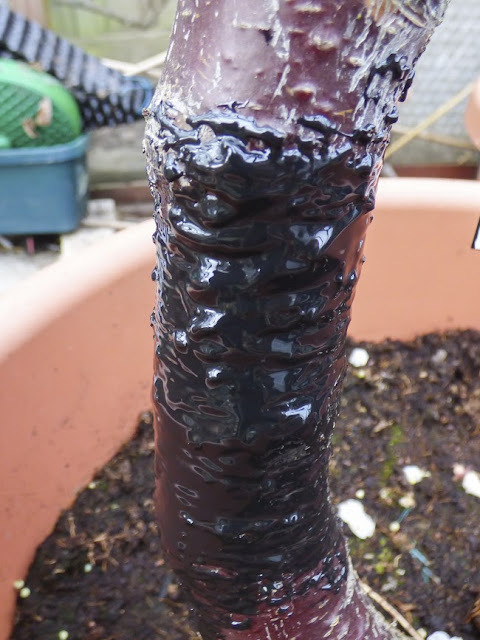 The aim was to smear some tree grease low down on each of the trunks of the apricot, peach and nectarine trees in the garden greenhouse. I'm hoping we don't have any super resourceful molluscs that find a way of bridging the gunky barrier. 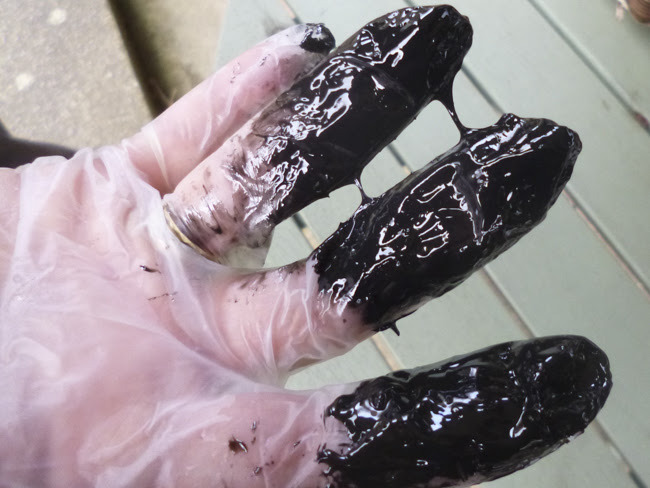 As for the glove - I won't be using that again. I haven't produced a harvesting chart for last year's brassica crop as basically, barring failures, what you get out is very much dependent on how much you plant. Instead I have categorised the plants as below. To be fair the plants that underperformed were at a disadvantage as we held off planting as the ground was really dry - hard to believe now isn't it? 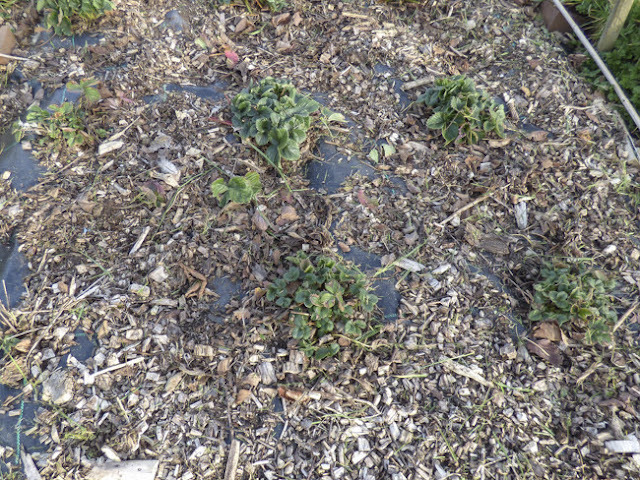 This resulted in the plants being past their best when planted. Success with brassicas doesn't come easily on our plot. Some beds have club root which at one time we could control by dipping plant roots in a control solution which is now no longer available. Once club root is in soil it is more or less there to stay but there are some things you can do to increase your success. 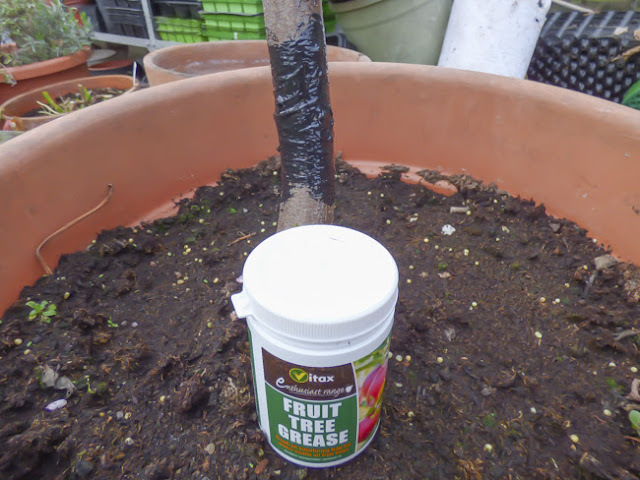 Club root likes an acid soil so increasing alkalinity by adding lime helps. 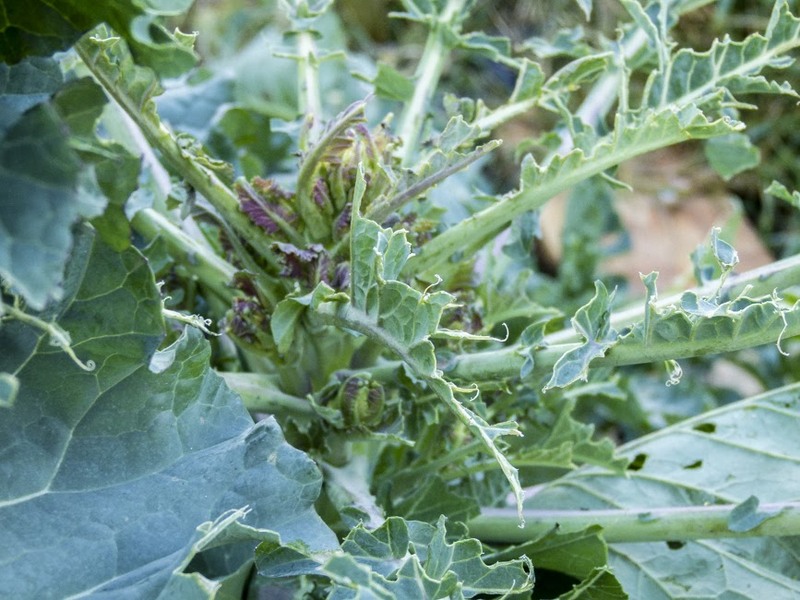 We also grow all our brassicas on in pots or modules before planting out to give them a chance to develop a root system before coming under attack. 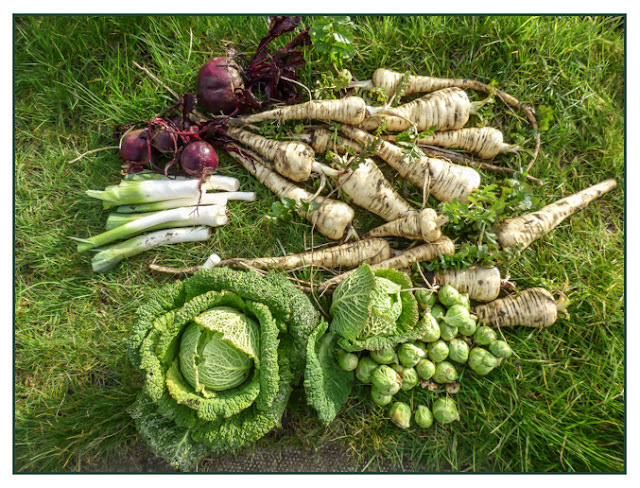 There is also an ever increasing number of club root resistant brassica varieties available and the ones that we have tried seem very good. We have beds that don't seem to be affected and so any varieties without resistance are planted in those. We are never really ready to start sowing seeds in time for the early brassicas and so we 'cheat' and buy a collection of young plants. I have to admit being shocked the first time we received an order as the plants looked nothing like as strong and healthy as those we grow ourselves but after being given some tlc they do recover. Once brassicas are planted on the plot we have to cover them. 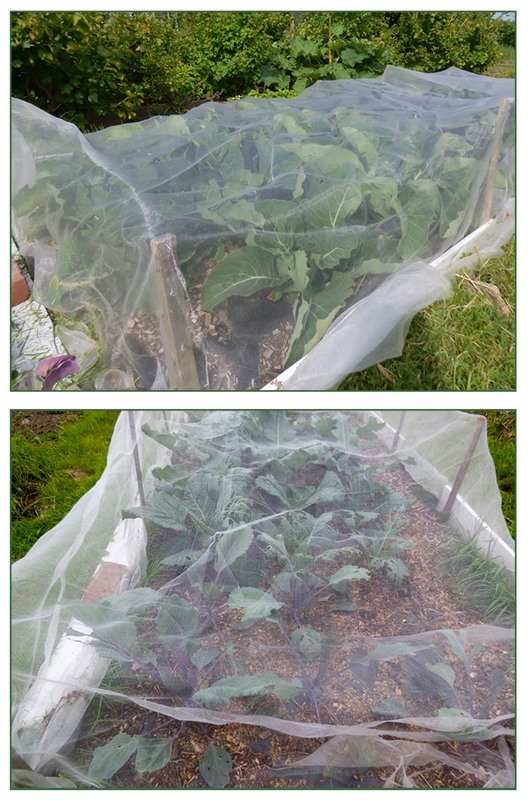 Whitefly are a real nuisance on broccoli plants and so these are protected under enviromesh. Caterpillars of the large and small white butterflies will also wreak havoc given half a chance. The large whites are more devastating as they 'hunt' in packs where the small white lays eggs well spread apart. If you are in any doubt about how voracious caterpillars are then watch this video that we put together some time ago. As double protection against wood pigeons and butterflies we use butterfly proof - well almost - netting. If there is a way to sneak under a resourceful butterfly will find it. So what will we grow this year? 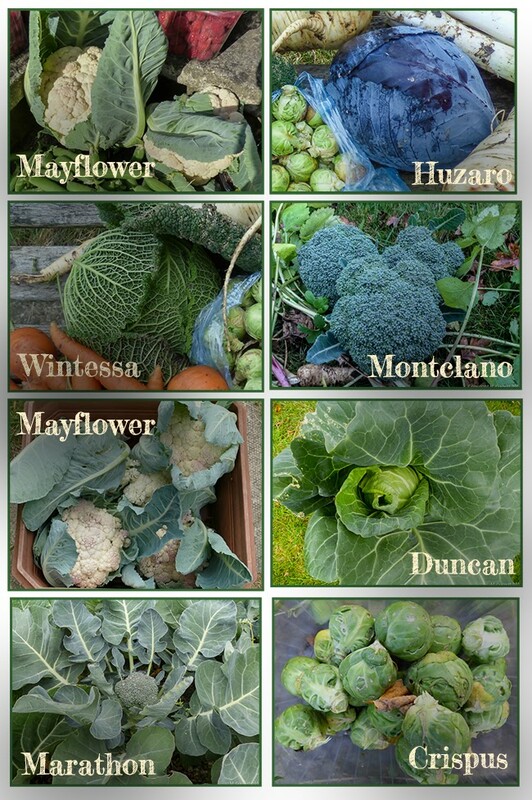 An early plant collection from Marshalls containing: calabrese - Marathon, Cabbage - Duncan and cauliflower - Mayflower. These have arrived and potted up in modules. Martyn posted about them here. If Saturday was a day for the plot, then Sunday it was the turn of the garden to receive some attention. At least half of the time was spent in the greenhouse. 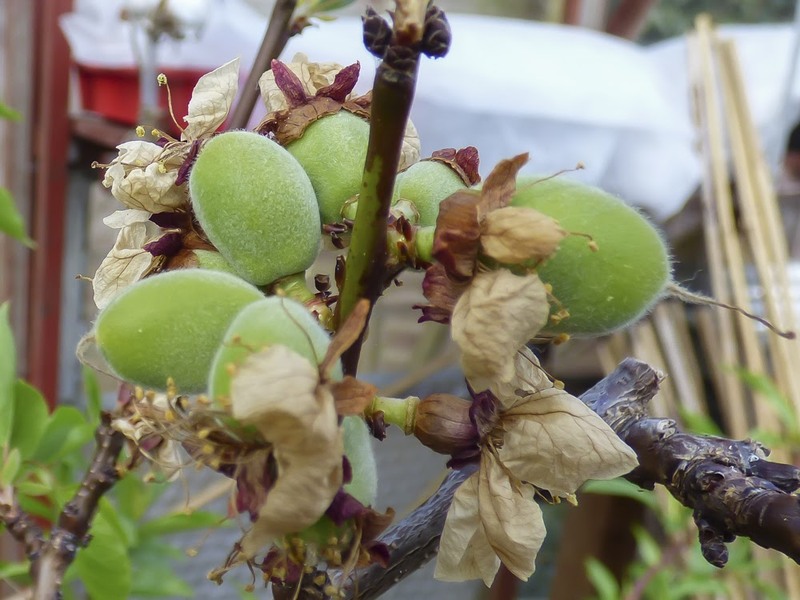 The first task was a bit of pollinating, just in case the bee that I spotted in there on Saturday failed in its duty to visit the peach and nectarine flowers. 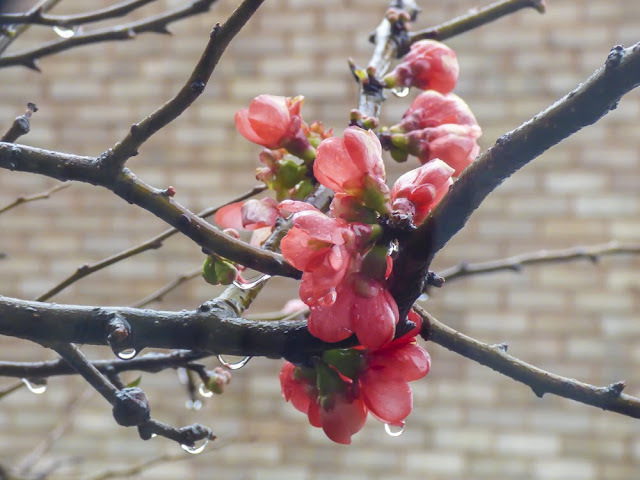 The apricot blossom is now falling and so I can do no more there. 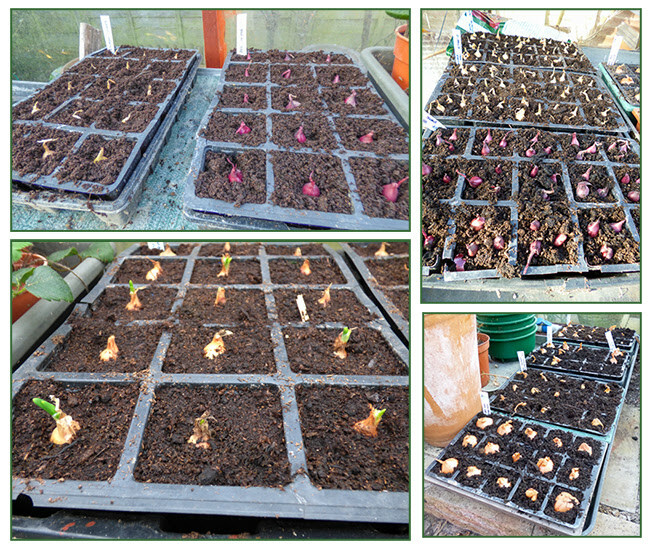 The next job was to plant the first lot of onion and shallot sets in modules. 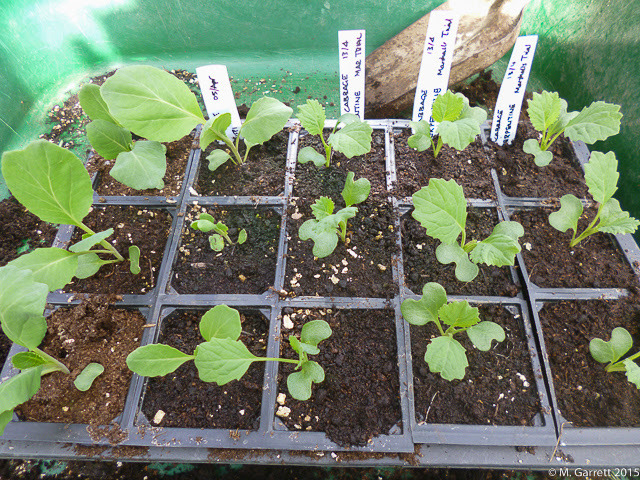 These will be left to shoot in the greenhouse and more will be planted later. Some of the shallot sets were huge and only just fitted in the modules. We planted, Sturon, Stuttgart and Red Karmen onions and Golden Gourmet and Red Sun shallots. The bag in which I sowed some salad leaves, at the end of last season, has grown well in the main with a couple of failures namely the radishes and spring onions. I sowed another bag with a selection of salad and some peas to use as pea shoots. A few weeks ago Janet over at Plantilicious posted about oca and I commented that I had never come across them before. Janet kindly offered to send me some tubers which arrived complete with instructions. 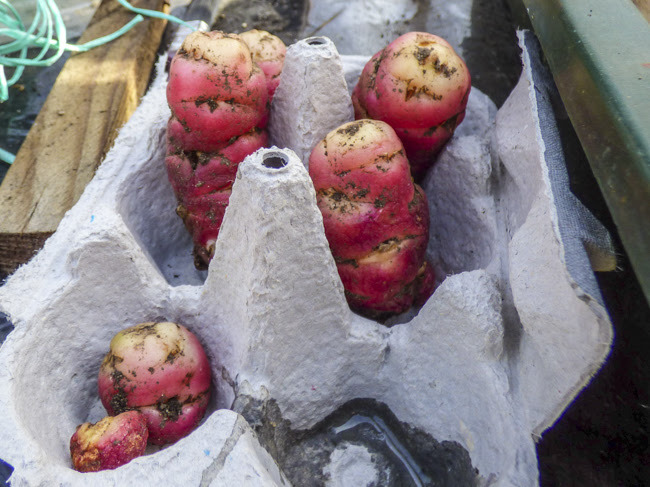 These stated that, if the conditions are not right for planting, they could be placed in a light frost free position as for chitting potatoes. I've done this and left them under fleece alongside the seed potatoes. 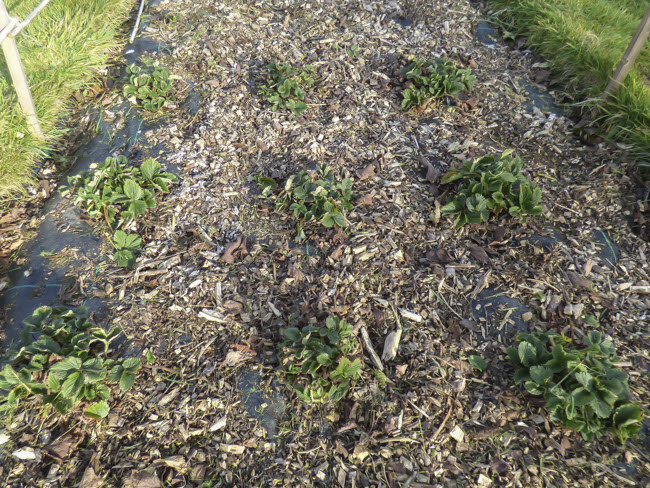 Outside I planted some native primroses that I had growing in a seed tray in a few gaps amongst the hellebores These came from self sown plants on the plot. 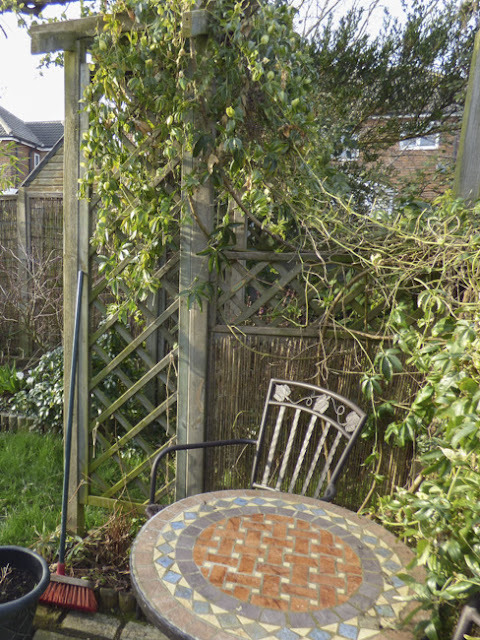 I think once I have some plants set seed this year I will scatter some in this area as I think the addition of a few primroses here will work. 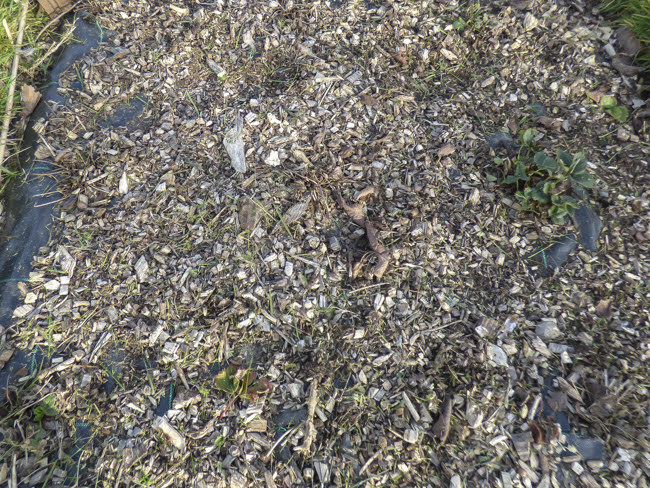 I may even find some baby plants on the plot or some of the larger clumps may need splittings. The late flowering clematis had started to shoot and really should have been cut down earlier but better late then never. It would be far easier if it wasn't snuggled up to the passion flower. The passion flower was trimmed a little but may need a bit more attention. Martyn mentioned in one of his posts, that in a tub that we planted up for winter/spring interest some bulbs were bullying a heather and pushing this out of the pot. I had to tease the heather out of the pot to reposition it as the daffodil shoots had grown through the rootball. The shoots are really yellow and so hopefully they will now green up and the plants can live in harmony. 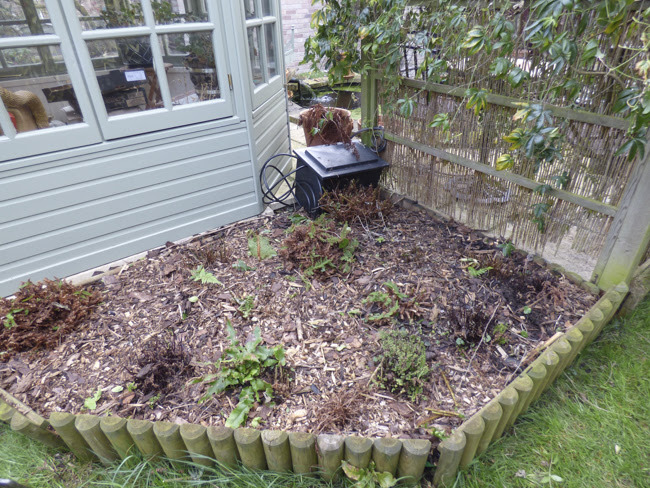 The other task of the day mostly fell to Matyn as we wanted to rearrange our 'cold frame courtyard'. The first phase involved emptying the WoodBlocx raised bed and moving it. At the moving stage I was called in to provide some additional muscle! The raised bed is now in place and the next job is to move the cold frames. All we need is for the weather to hold out! The rain held off for a day or two and on Saturday we managed a long overdue visit to the allotment. My main focus was centred around fruit. I had tackled the most dangerous pruning back in February. This involved battling with the vicious thorns of the tayberry. 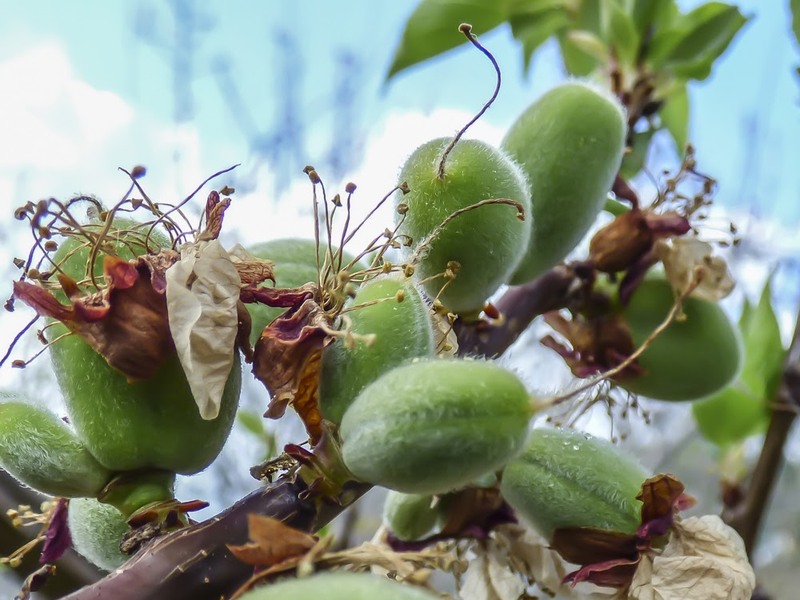 I was very severe as I think leaving too many canes causes problems later when much of the fruit is hidden beneath a tangle of thorny growth. This year I will also remove some new canes as they grow in an attempt to make final pruning a little less hazardous. 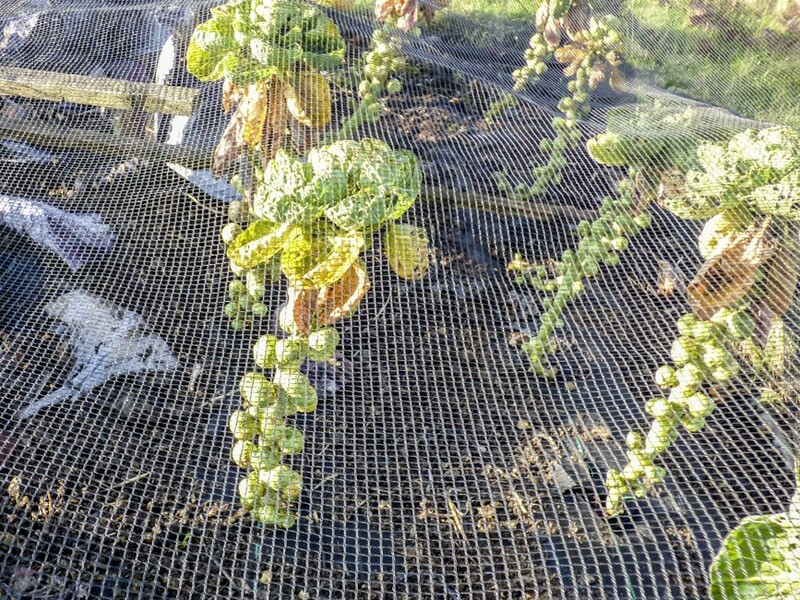 This weekend it was the turns of the gooseberries and jostaberries to face the chop. The gooseberries didn't require much attention. It was just a case of thinning the shoots by removing those growing into the centre of each bush and taking out any growing too close to or crossing paths with a neighbour. It's not easy to show before and after in photographs but hopefully you can see how the centre of the plant has been opened. 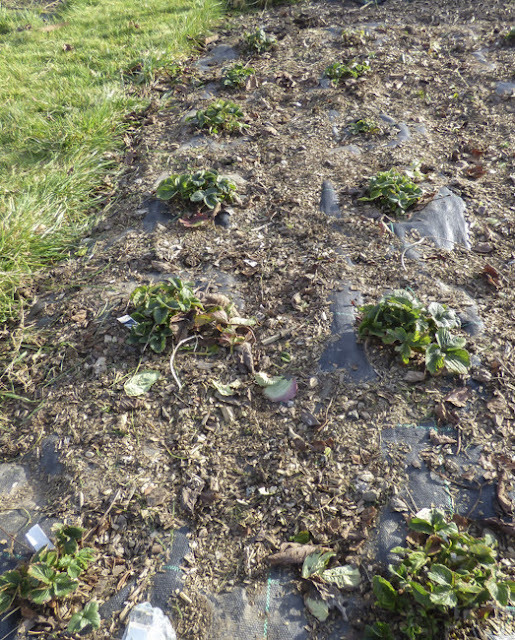 You can also see that the beds need weeding. The bushes were planted before we became converts of weed control fabric. Six gooseberries were give this treatment. The jostaberries needed a bit more attention but I worked on the same principle as for the gooseberries. If the weather had been friendlier I would have pruned earlier as I had to be careful not to knock off the buds already clothing the branches. I hope you can see a difference. 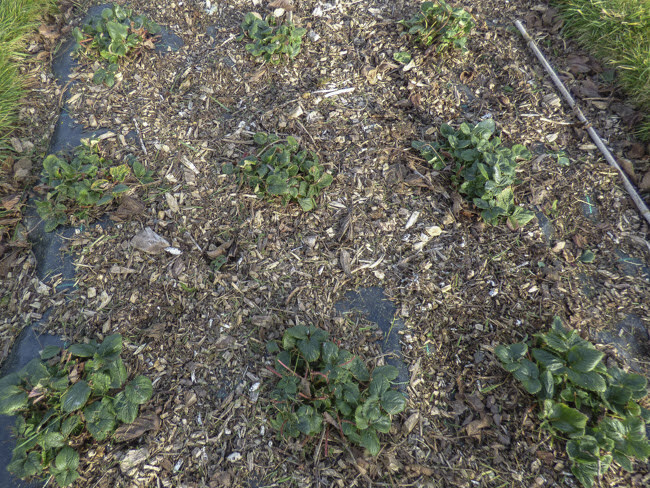 Maybe it isn't obvious from the photos but the prunings from the gooseberries and five jostaberries filled a wheelbarrow. 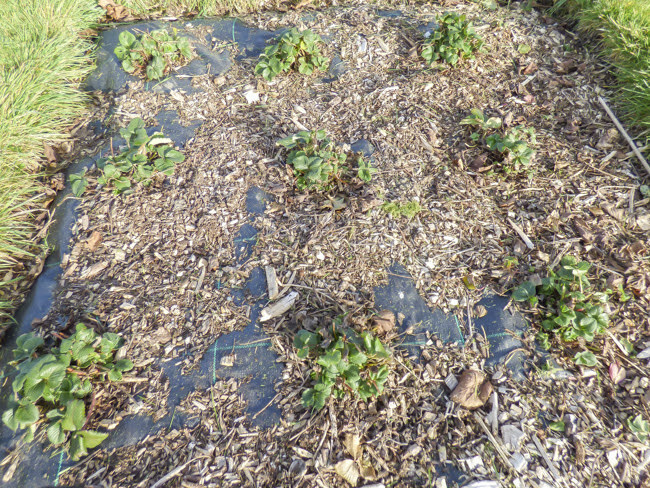 Next I started on tidying up the strawberries by removing dead and old leaves. The back two rows in the photo above have been tidied and the front row still needs doing. In all I think I have tidied about a fifth of the strawberry plants. So what was Martyn up to all this time? He was busy playing at being a lumberjack which he has written about on his blog here. Before we came home we gathered together a few vegetables. A while ago we bought some beetroot and mint dip from the supermarket and really liked it. Then the second lots that we bought, (like most of their soups) tasted of nothing but garlic. After perusing the label I came up with my own version. 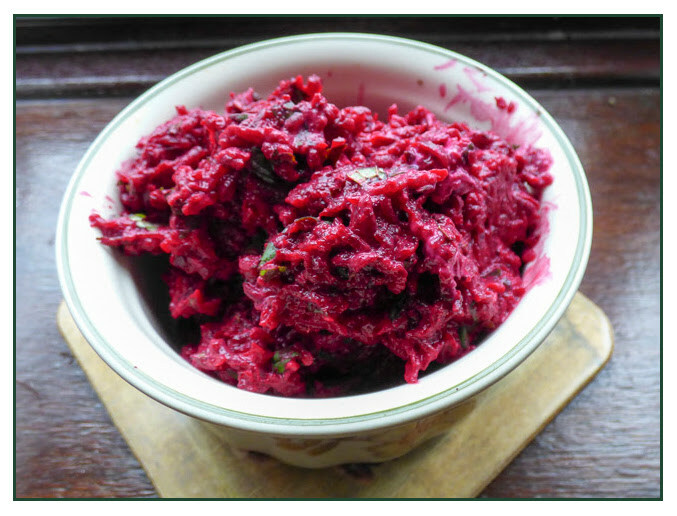 The beetroot we harvested is destined for another batch. If you are interested my 'recipe' is here. This week I am linking to Harvest Monday at Dave's Our Happy Acres. It was very topsy-turvy last season as far as our onions were concerned with the autumn planted sets not only out performing those planted in the spring but also keeping better. Autumn set are planted straight into the ground. 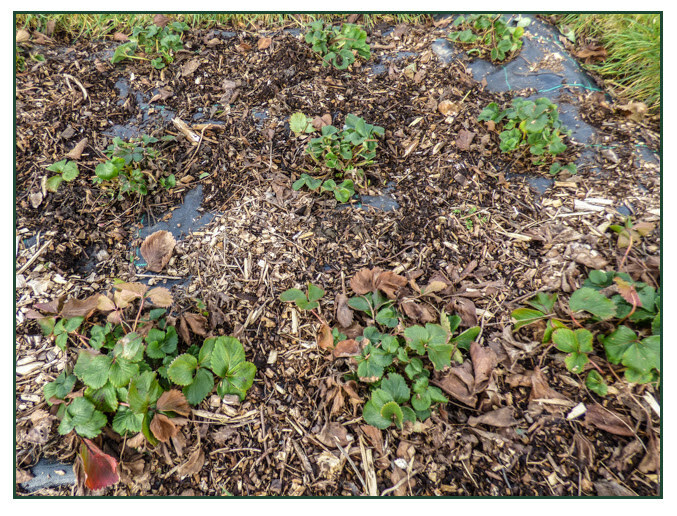 As with much of our planting we plant through weed control fabric. 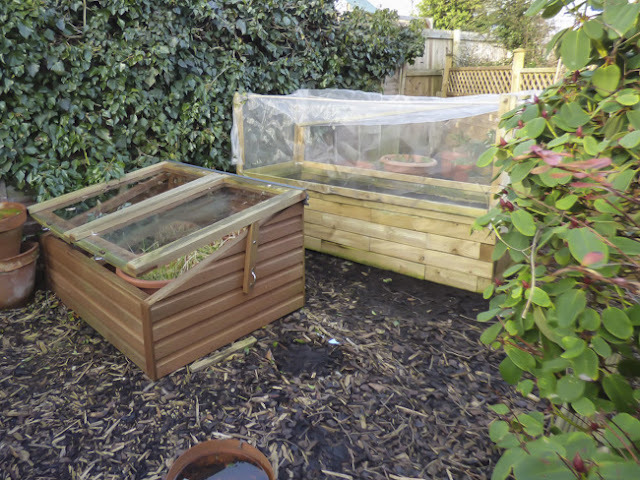 Channels are cut into the fabric and the onion sets are planted along them and either a well rotted manure or wood chipping mulch (whichever is available is applied). I always found weeding between onions to be a problem. 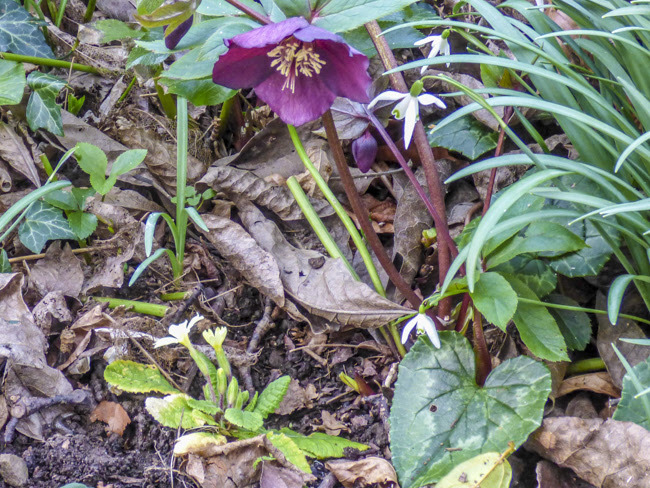 It was difficult to avoid bending their leaves or uprooting bulbs in the process. The weed control fabric makes this easier and also avoids weeds out-competing the onions. 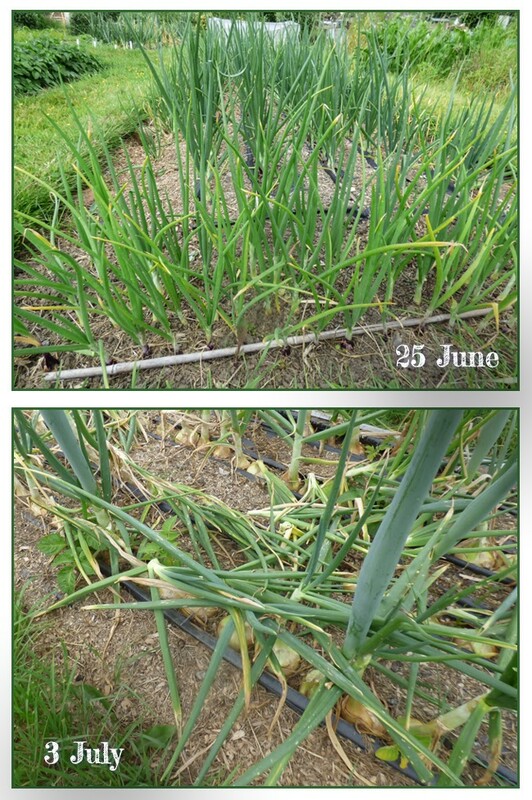 At the beginning of July we started pulling the autumn onions as we needed them and in mid August we lifted all those remaining. Autumn onions are not supposed to store well but these onions kept well and we were still using them after we had pulled the spring planted ones. To give the spring planted onions and shallots a head start we plant as many as we can find room for in modules left in the garden greenhouse. Last year we started planting in February so we are a little late this year but the sets start shooting quite quickly. You may notice - the top right photo - that we plant some sets in clusters. This way we end up with several sizes of onions. We don't always need a large one for cooking. These are planted out before they become pot-bound as this can halt growth and sometimes the plants don't recover well from the set back. 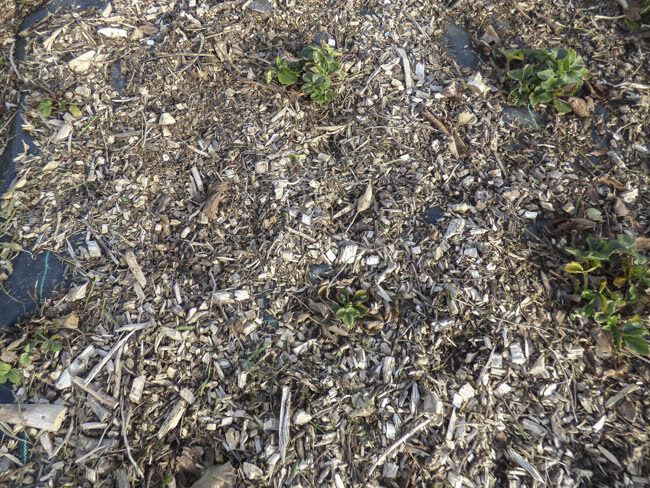 The sets that were left over are planted directly into the ground. The ends of the rows in the photo above are planted up with sets. 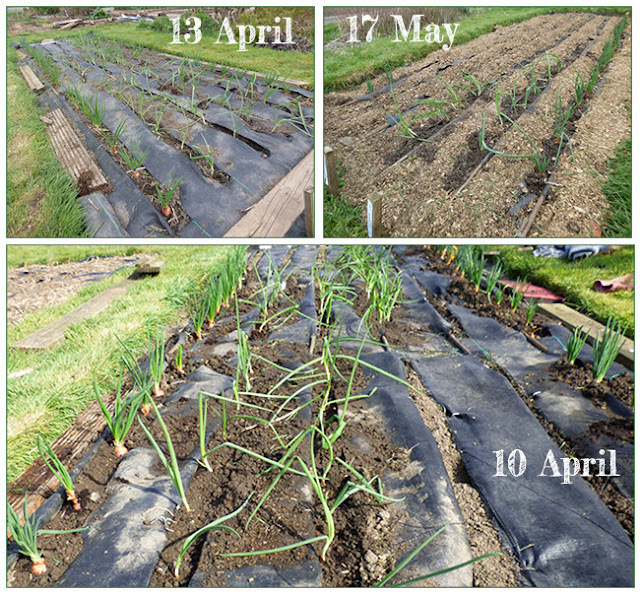 The shallots are planted down each edge of the bed. At the end of the bed the remaining sets are planted very close together and produce onions a suitable size for pickling. The onions were lifted before the rain set in but had to be taken into the shed and greenhouse to dry as the weather turned wet. 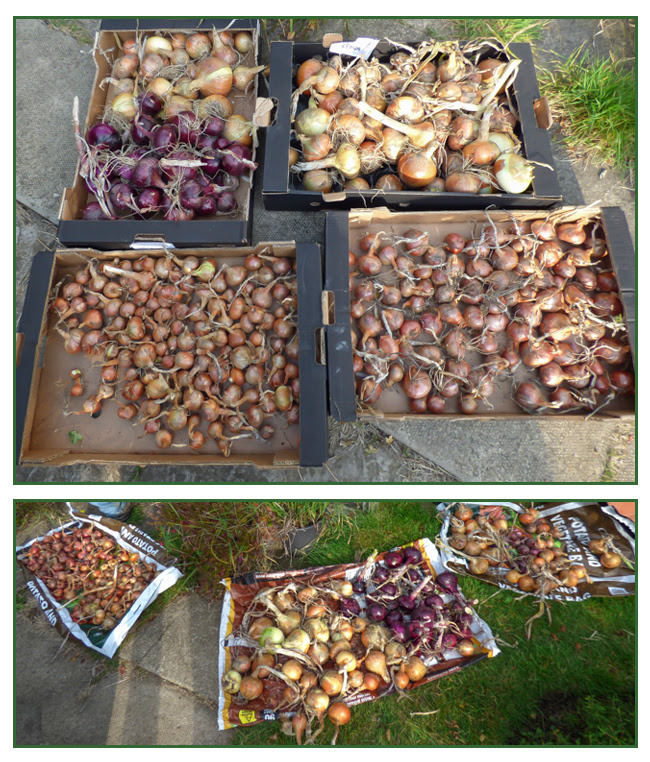 The damp atmosphere over winter lead to many of the onions rotting in storage. They were kept in the dry shed and summerhouse but the general dampness still managed to affect them. Strangely though the shallots didn't seem to suffer in the same way. 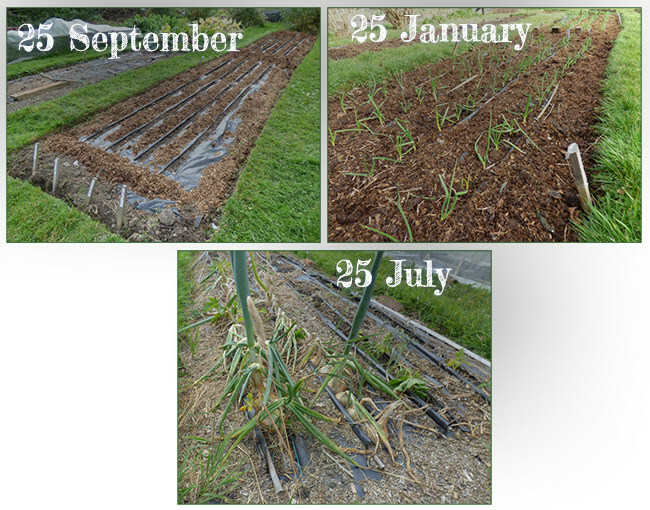 I think the mild winter and dry period during which the autumn onions were in the ground helped them grow well which isn't always the case. I wonder how they will fare this year. Autumn onions already planted are, Senshyu and some just called red onions. 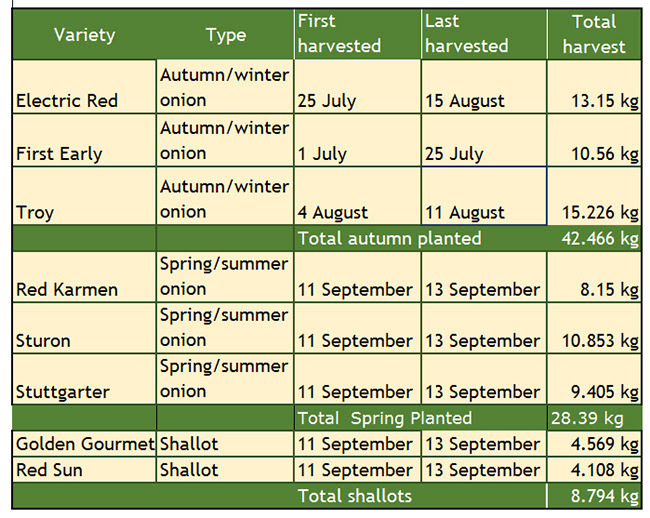 We will grow the same varieties of spring planted onions and shallots as last year.